Brandon Briggs (39) of the University of Maine follows through on an extra-point kick in this 2017 file photo at Alfond Stadium in Orono. He has decided not to return as a fifth-year senior next fall. The University of Maine football team will have to replace place-kicker Brandon Briggs next fall. Briggs, who won the job last season and converted 8 of 11 field goal attempts, has decided not to return as a fifth-year senior. The former Thornton Academy of Saco kicker will graduate this month but would have had another year of eligibility. UMaine head coach Joe Harasymiak said Briggs has decided to enter the workforce. Scholarship freshman Kenny Doak began last season as the starting place-kicker but missed two extra points in the first two games, including a critical one in a 24-23 loss at New Hampshire, and lost the job to Briggs. He went 3-for-5 in field goals. Doak was the kicker in the 14th Jeff Cole Memorial Spring Scrimmage eight days ago and converted two of three field-goal attempts. “Kenny has done pretty well,” said Harasymiak. “He has advanced from last year and he’s got to keep moving forward. He had a couple of good scrimmages and gained some confidence. “He has the leg but he has got to be able to consistently strike the ball,” added Harasymiak. 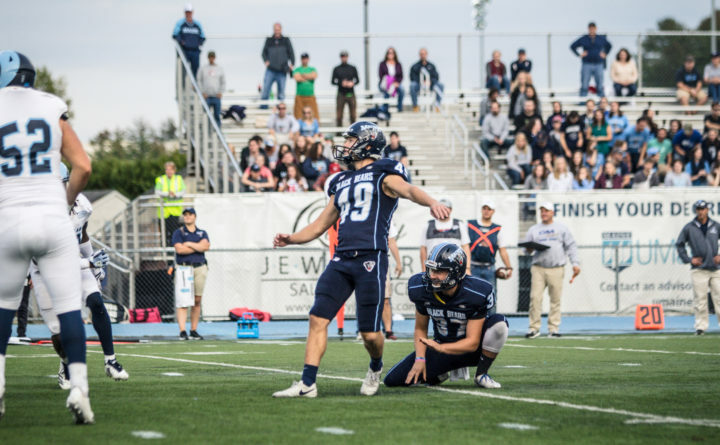 Doak will be challenged for the job by incoming freshman David Gelb, a first-team All-Shore and All-New Jersey kicker. He was chosen the Northeast Kicker of the Year. “He will come in and compete for the job,” said Harasymiak, who noted that such competition is healthy for the team. Former John Bapst High of Bangor kicker Patrick Leonard will also be in the mix. He was the kicker in 2016 but went just 1-for-6 in field goals. They will also compete for the kickoffs job along with returning punter Derek Deoul. In other news, defensive lineman Uchenna Egwuonwu, who missed last season after being suspended by the school for an off-field incident, will transfer to Division II Lindenwood University in St. Louis, according to Harasymiak. Egwuonwu was in on 16 tackles in seven games during the 2016 season. “Hopefully, he’ll land on his feet,” said Harasymiak. The UMaine coach also said three players who have been sidelined by surgery should be ready to go when training camp begins in August. Former All-Colonial Athletic Association wide receiver and punt returner Micah Wright and cornerback A.J. Dawson are recovering from knee surgeries and safety Jeffrey DeVaughn underwent shoulder surgery. DeVaughn has played in 31 games and Dawson has appeared in 30. Dawson missed all of last season. Harasymiak and his staff are going recruiting and are looking to sign two offensive linemen to supply depth up front. That is their prime emphasis. UMaine, 4-6 last fall and 3-5 in the conference, opens the season Aug. 30 at 7 p.m. by hosting archrival New Hampshire.